Bikewriter.com: New feature! @$$hole du jour! I'm swamped today, getting ready for a road trip to the powersports dealer show at Indy tomorrow, and I just haven't had time to finish transcribing my Mission Motors design files. I'll get the rest of James Parker's interview up soon, and follow it with stylist Tim Prentice's insights. Whether Jorah Wyler talks to me remains to be heard, I guess. I've got some cool ICE stuff in the pipeline, too: a feature on Shinya Kimura that I'll post in the next couple of weeks - part of an 'L.A. Confidential' pairing, in which I'll compare and contrast Shinya with Ian Barry and Falcon. But what about today, you ask? Well, I'm initiating a great new feature, in which you can participate and even win (somewhat) valuable prizes! Yes, I'm finally launching @$$hole du Jour, something I've been meaning to do since that one fateful day in 2004. Yes, I remember it like it was, well, about 7 years ago. I'd pulled some sportbike out of Motorcyclist's fleet to ride home, and had just turned off the 10 onto I-5 in heavy-but-flowing SoCal traffic. I was getting ready to migrate into my position of choice - lane-splitting just to the right of the fast lane - but I was still in the shoulder lane when a huge SUV towing a large boat trundled right down the next on-ramp. The @$$hole driver looked right at me and pulled all the way into my lane. For a few seconds, the only place for me was the space beside the trailer tongue. I thought, What a great photo feature this would make for Motorcyclist, if I could only get a picture of this d1©&head. The world still needs a place to document and archive these $#!tty cage-driving @$$holes. 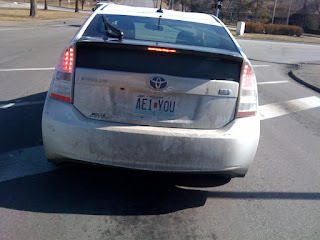 I actually thought this license plate was cute as I approached it, since it almost spells out the mnemonic for learning which letters are vowels - A, E, I, O, U and sometimes Y. But soon after noticing it, my inner voice was screaming "Aiee! You @$$hole!" @$$hole nomination: Priapus driver pinches me off as drifts into the left lane without signalling or shoulder checking (or for that matter, listening.) Maybe he's confused about his 'hybrid' car and thinks he should drive as if he's inbred, to keep things in balance. I wanted to pull up beside him at the next light and tell him, "Hey, d1©&head, in the future please try to either look, listen, or signal," but I was too grossed out when I looked in and saw him engaged in a very vigorous two-handed nose-pick. He was actually pulling his nose off to one side with one hand so he could reach into the other nostril to the wrist. OK, that's an exaggeration but you get the idea. Ladies and Gentlemen, I present you the first-ever official @$$hole du Jour! 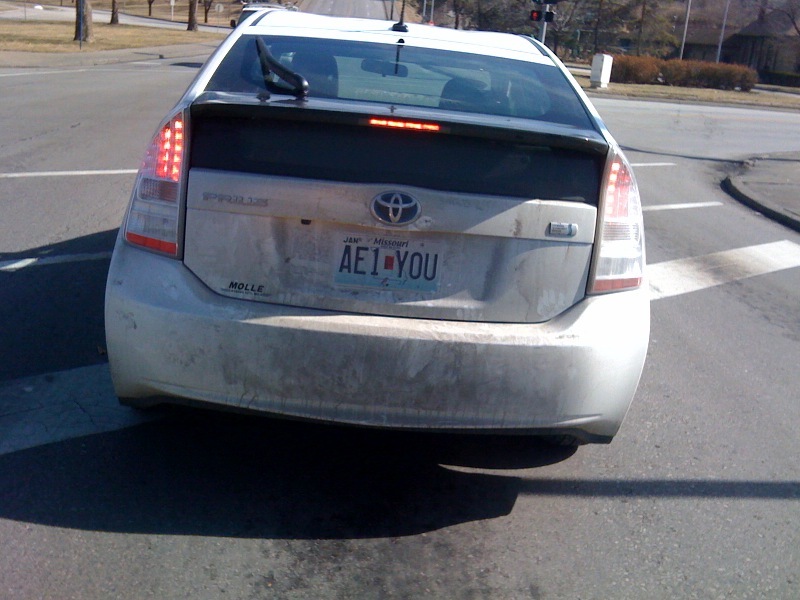 The driver of the Toyota Prius with license plate AE1 YOU. Now, I invite motorcyclists everywhere to vent their frustrations without risking some self-entitled cage-driver pulling his Glock and offing the righteously indignant. Not only will I post your photos and accounts, I'll award (semi-) wonderful prizes for submissions. @$$hole du jour is scored on the honor system, claims are not verified. Entries must consist of a photo and description of events. The photo must allow readers to either identify the car (license plate) or driver. Extra points will be awarded if drivers can be identified by name. Extra points awarded for humorous and/or compelling descriptions of cage-drivers' idiocy, and overall hairiness of evasive maneuver. Extra points for video links! Maximum points will typically be awarded for actual accidents with injury. Please don't do anything in order to get the photo that will alienate uninvolved drivers. Although the whole point of this is to give motorcyclists a way to vent frustration without violence, drivers identified as @$$holes du jour are welcome to complain directly to me. First round of prizes: Copies of 'Wrenched' - motorcycle poetry by Ed Milich.